This dish is a very simple one, it is not at all difficult to prepare it. A nice addition to pasta were the pine nuts. They add a little crunchiness from time to time when you happen upon one in the creamy pasta. Ingredients you need for making pasta with spinach. 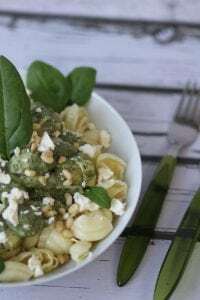 How to prepare spinach and feta pasta. Pour olive oil into a pan. Add garlic crushed through a press. Fry for a few seconds on low heat. Add thawed spinach and white pepper. Fry for 3 to 4 minutes, stirring occasionally. 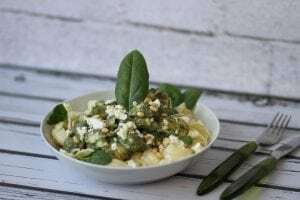 When the spinach is slightly fried, add the cream and add the crumbled feta cheese. Cook for the next 3 minutes, stirring thoroughly. In the meantime, cook the pasta in some water with the addition of a teaspoon of salt. The pasta should be soft after cooking but it should not break up. Mix the cooked pasta with the sauce. 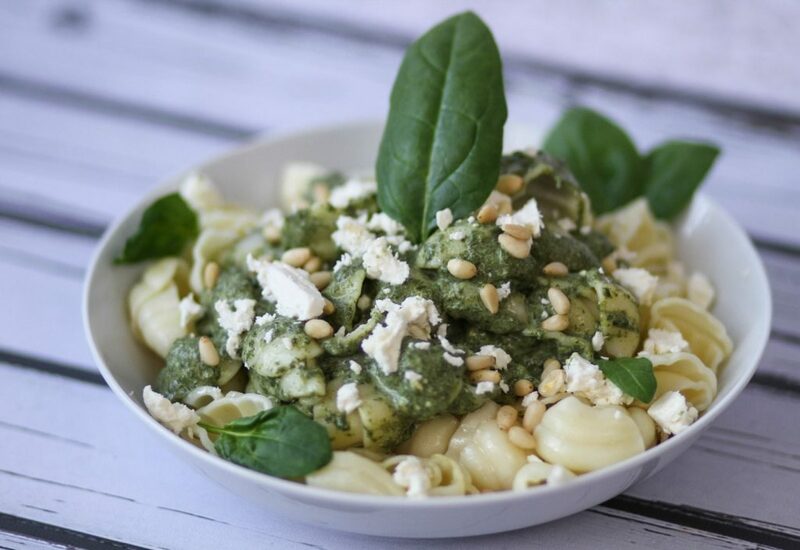 Serve topped with pine nuts. 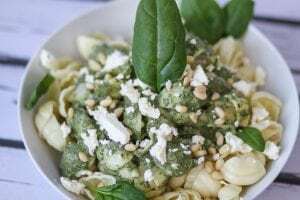 What you need to know when making spinach and feta pasta. I used frozen spinach purée so there were no leaves, it had a creamy, uniform consistency. If you buy frozen spinach leaves, after frying the spinach should be blended. Do you like simple dinner dishes? If so, then try our recipe for Baked potato skins.